Shocking film, uncovering the painful truth about indifference to, and collaboration with the Nazis in WWII, when 75 percent of the Jews in the Netherlands were annihilated, breaking with the myth of the "good" Dutch. This investigation into the dark past explains why Anne Frank and 100,000 other Dutch Jews were deported. Documentary maker Willy Lindwer's new film, Goodbye Holland, adds a shocking dimension to the debate on the omnipresence of anti-Semitism. The massacre of Dutch Jews during the Second World War resulted not just from the barbarous occupation of the Netherlands, but also from the zeal with which Jews were deported by Dutch officials, aided by an army of traitors and stool pigeons. In a moving personal exploration of the scale of this collaboration and betrayal, Lindwer shatters the myth of Dutch tolerance past and present. After a lengthy quest, Willy Lindwer unravels the truth about the betrayal of his aunt and uncle, who went into hiding in the eastern village of Varsseveld. They and six others were betrayed by a young family who coveted the apartment where some of them were in hiding. 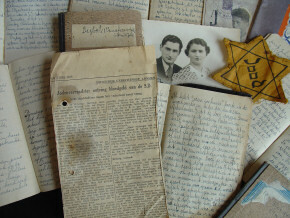 The family received a 75-guilder-reward for their pains, and the aunt and uncle were gassed in Auschwitz. In Jerusalem, Willy Lindwer found a unique diary written by a survivor of the arrests. "The man who betrayed my aunt and uncle was a Dutchman. So was the police officer who arrested them. So was the man who drove the trains full of Jews to Westerbork, the main transit point for the concentration camps, and so were the people who betrayed and arrested Anne Frank. What possessed all those Dutch people to allow 78% of the Jews to be deported when they'd been living in this country quite happily and respectably for the past 400 years?" The film also deals with the period during and after liberation, when the handful of Jews who returned met with an icy reception from both the government and their fellow citizens. There was the same appalling racism, which took a variety of forms. Some people snarled: "Shame they didn't gas you." Others stole huge quantities of household effects they had been given for safekeeping, and prevented Jews from reclaiming their own homes. "My own parents weren't allowed back into their house in Amsterdam," Lindwer says. "A year after liberation, they were still being forced to live at the address where they'd been hiding." Together with the internationally renowned Dutch writer Harry Mulisch, many of whose books are about the war, Lindwer delves into the history of Lipmann-Rosenthal (LIRO). This bank plundered Jewish assets during the war and used the money to fund the Nazi murder machine, and Mulisch's own father, an Austrian who took Dutch citizenship, was one of its directors during the occupation. Mulisch had a Jewish mother, who divorced his father before the war. For the first time, Mulisch talks openly and at length to the camera about his father's role.